It’s been getting warm here. Daytime temps reaching the mid-70’s and looking gorgeous outside. The kids have been playing with Pookie’s water table the past two days. Inside the house It gets just cool enough in the morning and evening to still need the wood stove to be lit. I checked on the apple tree. We have to watch it closely for signs of budding. Last year, we forgot to use the organic spray on it and the moths completely destroyed the apple crop. This year, I will be using the spray once a month to keep the moths and other pests from damaging the apples. 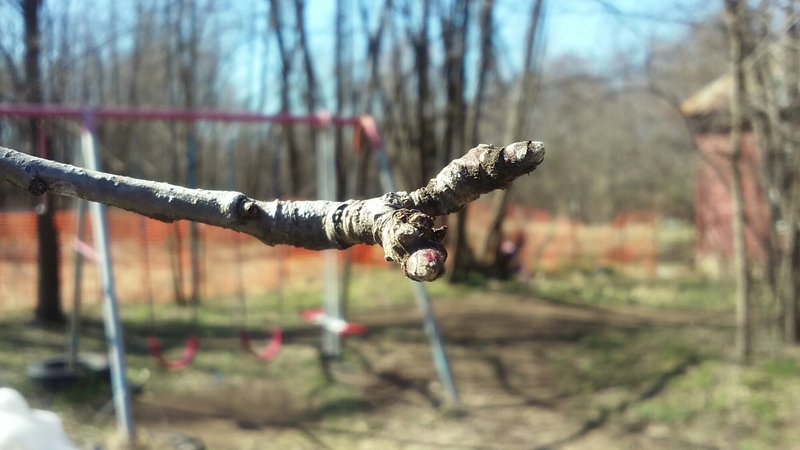 As I looked the tree over, I found the very first signs of new leaf buds. I will start treating the tree this week. The next time the treatment will be critical will be the little flower buds starting to appear and also when they open. The red wasps are starting to become active. Next payday, I will be buying some wasp sticks by Rescue to hang up. These are extremely effective sticky traps. It gives us a no-pesticide method of getting rid of the red wasps without risk to honey bees. Sitting here in the quiet, listening to the frogs in the creek run-off, the breeze blowing through the trees, and the laughter of the kids as they play is one of my favorite times of day. I am truly blessed in my life here. Yes, it is harder work for me, but the peace it brings is worth every moment. Having kids, you often deal with a period of time when you have a picky eater. Most common problem is a child who refuses to eat vegetables. We have dealt with that with our own kids. Having one who is autistic, we deal with it on a fairly regular basis. We found an answer though that may work for other families as well. This morning, I took the kids outside and we began planting vegetable seeds into the seed starting trays. I had a variety of vegetable seeds and let the kids pick out the ones they wanted for a special garden box that will be set up in their fenced play area. They chose grape tomatoes, sugar pod peas, and green beans. I helped them to plant the seeds and we have them out in the sun. Once large enough, we will be transplanting them into a square foot garden bed in their yard. These veggies will be ones that I will let them pick and snack on. What have me the idea originally was memories of my own childhood. My parents always had a large garden each year. When playing outside, I often would pick a handful of green beans, peas, or a tomato to snack on. I loved eating straight from the garden. As a parent, I have learned that if I let the kids help grow a few of their favorites, they were far more likely to eat the veggies at mealtimes. It also encourages healthy snacking. When it is warm enough, I want to plant a small strawberry patch as well. Both kids love strawberries, so they should be a good choice. It is definitely worth a try to plant a few veggies and see if the kids are more likely to eat them. Even if you only plant a small garden bed along your house or in pots on your patio, it can help. Kids take prize in harvesting a few veggies from their own garden plants to add to the family meal. It can make a big difference. Recently, I have been reading various blogs about the off grid journey that other homesteading families have been taking. It is a real education to see just how varied the lifestyles are. Some adopt a few of the off grid ideologies, while others go all out. It would seem that there are as many variants as there are homesteading families. Each has their own way of thinking and living out their dreams of self-reliance and off grid life. Some families are still living the urban life, but are slowly taking on a more simple attitude. They are paying off their debt, without accumulating more, and are becoming more frugal in their spending. Some families are rural and just taking life a bit slower, planting a garden to feed their family over the summer months, and possibly raising a few chickens for eggs. You have bloggers who are definitely in the prepper category. Even within that category, you can have varied levels of self-reliance. Lastly, you have those who fit anywhere in between these examples. Hobby farmers, small family farms, tiny house owners who are trying to live a full life on less, and many more. In nearly every case, the bloggers are in a state of transition. They are still evolving in their journey. Some make the transition quicker than others. There are those who seem to meet their journey’s goal within a very short time. Likewise, you have those who are moving towards their goals at a much slower pace. It is inspiring to read about their journeys. I always learn a new perspective from reading their blog posts. I also learn what they have found to work, and what doesn’t. This brought to me a challenge. I have often spoke of scaling back and purging the unessential things from our home and lives. Recently, I began following a video blog, Starry Hilders Off Grid Homestead, on YouTube. She has a Facebook page as well. While watching her videos, I began to feel a convicting in my heart. It was a challenge coming from within to take our simplicity a little further than we currently are. It was also the kick in the arse that I have needed to feel reinvigorated about our journey. While we have been dealing with job changes, our son’s therapy routines, and homeschooling, I have slowed down in a few areas that I used to enjoy. The first is doing laundry by hand. I used to enjoy it, even in winter. On warm days, I would wash the laundry outdoors, enjoying the sunshine as I watched the kids at play. I loved the peaceful nature of that task. I actually looked forward to it. I washed laundry every day or two, then hung it out on the clothesline to dry. In winter, I would heat up the water on the wood stove, wash laundry indoors and hang it up on folding clothes racks near the wood stove to dry. We had family members staying with us over a long period and I got out of the habit of hand washing. We had gone from a household of 4 to a household of 8 people at one point. Being the lone person hand washing laundry, it just became too much. So, I started going to the laundromat in the nearest town, 10 miles away. This became a habit. Now, several years later, I still use the laundromat. I look at myself today and wonder why I am doing that? I spend nearly $70 a month doing laundry. That is ridiculous!!! I could be doing it for free here at home, utilizing the hand washing and clothesline, instead of feeding handfuls of quarters into the machines. As I watched one particular video, I remembered something that really had me kicking myself in the arse. Washing laundry by hand is not only faster, but often is more effective in cleaning the laundry than using machines. When washing daily, the laundry takes less than a half hour to wash and hang out on the line. It can actually take me longer to set up the laundry tubs to do the washing and then rinse them out afterwords, than it takes for me to wash the clothing and hang it up to dry. On a hot summer day, the laundry can be fully dried within an hour. With that in mind, where is the laundromat making life easier? That $70 a month spent at the laundromat is $840 a year that we could have spent elsewhere. A second area that I have had to rethink is our garden. Each year, we have either had to deal with drought or our garden being flooded out by heavy spring rains. One year, the plants did great but early summer heat damaged the garden. Many people lost their gardens in the same way we did. This has been a constant frustration point for me. I love having a garden and home canning the harvest for our pantry. I take delight in going out in the garden to pick the vegetables and salad fixings for our meals each day. Having the garden fail to produce has disheartened me many times. In the homesteading blogs, I am seeing more and more posts about raised bed gardening, also known as the Back to Eden or the Square Foot Garden methods. In some blogs, I read about those who simply lay out cardboard on the ground, then heap their straw/manure/compost layers on top to form a mound into which they plant their garden plants and seeds. Other blogs use the actual raised beds that are built using wood, bricks, cinder blocks, or large stones. Years ago, in the early 1980’s, I used the raised bed method to grow a garden in an upper desert region. This method was very effective in helping me to have a productive garden. I actually produced more harvest than my pantry had room for! I gave away about half of the harvest one year. Looking back, I really wish that I would have set up the raised beds here on our homestead much sooner. It may have made all the difference in whether or not we had a harvest on the years when the gardens were being flooded. A third area that I am feeling needs changed is the criteria of what we will hold on to and what we get rid of. Even with all the purging that I have done in the past, we still have more than we actually need. The problem is that we always find new things that we want to keep. In summer, it is not difficult to go to yard sales and find something that ends up being an impulsive purchase. That alone can increase the stuff in the home that is not really necessary. This also applies for sales at the store. The purchase always seems reasonable until you get it home. Once home, you find yourself wondering why you bought the item. For this reason, I rarely go to a yard sale. When I do go to them, I have a specific item that I am looking for. I stick to my agenda and try not to allow myself to be swayed into the impulsive buying. As readers already know, I have been working on clearing out a room of the house that has been used for storage for nearly the past two years. Much of what was stored is being purged from our home. We have thrown out bag after bag filled with items that we had held on to, but was not needed. Of all the belongings in that room, nearly everything has been purged from the room with the exception of the furniture, a few books, and a tote of photos. This has lit the fire under me to do the same with the rest of the rooms. Once the rooms are fully purged of the unnecessary things, we will have to have a system in place to avoid bring in too much again. One method is to limit items by the “one item in/one item out” rule. This works well, if you stick to it. I am planning out my new raised bed garden space. It will be in higher ground and the beds made from cinder block. It will also be in an area that will be easier to water in summer as well as being closer to the house. I am thinking of incorporating trellis in the garden beds to save on space. Lastly, I have a major goal for this season to get the house fully organized by summer. I have always loved the idea of “a space for everything & everything in its place.” Once I am finished, this will be the way I will have the home set up. I have learned in life that if the right system is set up, your daily life is much easier. You still have your daily chores, but the intensity is greatly reduced. The storage issue has always been a big one in our home. Typical of the time period in which it was built, our home has no built in storage. No cabinets anywhere in the home. The only closet is one that was added within the past 20 years. All storage is either shelving added on the walls or bookcases/shelving units that we have brought in. This is yet another area of organizing that I will be addressing as we do our remodel. When each room is done, some form of storage will be added to the room. Most likely to be added will be shelving or bookcases. Over the weekend, hubby was home for his time off from the truck. What a LONG 8 weeks it was that he had been gone! Luckily, this isn’t always the length of time apart. We sure have enjoyed the family time though. As always, it goes by far too quickly for us. I awoke early today. Long before sunrise and much earlier than my usual. It is surprising when I consider how tired that I was after yesterday. Sunday was our “Family Day” when we just had fun together. We had celebrated a joint birthday party for the kids at a children’s museum. They had a lot of fun there. Being a trucking family, we are having to be creative in our celebrations. Little Miss’ birthday will arrive before Daddy’s home again, and Pookie’s birthday will arrive just after he heads back out on the truck. Looking at the calendar, we realized that Daddy’s next home time will be Easter weekend. That would not have worked out for a birthday party. To wait until the next scheduled hometime would put the kids celebrating late April/early May. So, we had the party on Sunday instead. On their actual birthdays, we will have cake and presents. This was simply a special gathering to have fun with friends and family. On Monday, we had a work day. I had cleared out the back room as much as I could without help. There were boxes that Hubby had to sort out and lifting that I cannot do. So, he helped me with that portion. What a task! Thankfully, it got done. We are only keeping an extremely small fraction of what was there. About 90% of it is either being donated or was put into the burn pit. It has been frustrating to see the amount of damage the field mice had done over the past 2 years that the room was used for storage. Blankets, quilts, sleeping bags, clothing, were damaged. We will definitely be investing in more storage totes in the future. Many of the bedding items were old, so I don’t feel as bad as if they were new. It is still an expense that we will have to make though in replacing it all. Now, the last of the room can be finished by me. Mostly clearing out a large antique desk and sorting through the bookcases. The closet will be another project for Hubby later since it contains only his things. Being so close to done is very rejuvenating to me. When first faced with clearing out a packed storage room, the task can seem overwhelming. You literally can feel drained just thinking about it. Now that it is nearly completed, I am eager to finish the job. During Hubby’s time out on the truck, I will be getting the room ready to move the kids’ bed into it next time he is home. Then, we will move into the kids’ old room. I am really looking forward to getting the front room rearranged back into a nice area for homeschooling and relaxing. It has been too long since we have had that. I also am going to love having more useable space in the house. For many, the idea of purging over half of your belongings can seem crazy. Let’s face it, we live in a society where having more seems to be the goal. People want to have the best of everything and more of it. This brings me to the topic I wanted to touch upon, Setting Our Focus. When we choose to simplify our lives, we have to reset our way of thinking. First, we have to consider just how we got to the place we are in. What choices did we make that led us to the lifestyle that is needing changed? We have to find those answers within ourselves before we can move forward in the simplifying. To skip this step is to set ourselves up to fail. We will be making the same choices and mistakes that caused up to be living in a way that brings about stress and financial worry. Most often, the greatest obstacle that people have is in their purchases. Our society has the idea that you need the newest and best of everything. That is the complete opposite of those who seek a more simplified lifestyle. Yes, we want the best, but only in the fact that we are wanting something that will last. One example would be a wheat grinder. There may be cheaper ones for sale, but buying one that will last for many years of hard use is preferable in that it won’t need repairs or replacing very quickly. Cookware is another purchase where better quality is the preferred. Again, this helps to prevent having to replace items after only a couple years of use. The purchases that we try to especially avoid are the impulsive ones. How often does a child ask for a toy at the store, only to forget about their new toy within a week of buying it? Clearance sales can be a nightmare. The impulse to buy something because of the lower price can entice you to spend money on something that you wouldn’t purchase if it were regular price. The money spent on the frivolous and impulsive purchases can best be used to either pay down a debt, build up your food pantry or other needed supplies, or to simply put away in a savings account. Here is a personal example. Recently, Hubby and I were out running errands and bought coffee. We went to Starbucks as a treat. I spent $11 for two venti (20 ounce) size cups of coffee. At a grocery store, that same $11 could have bought a 25 lb bag of flour with $3 in change left over. This is why I refer to Starbucks as a treat. It isn’t something that we do on a regular basis. We also are aware that the cost takes away from something else. This doesn’t mean that you cannot have fun and take the kids on outings if you are simplifying your spending. On the contrary! We are able to do more. A good example is the children’s museum. To get a family of 4 into the museum costs $32 for one day. Now, if that same family were to buy a yearly family pass, it would cost about $80. Just 3 trips to the museum would more than pay for that fee. When buying the annual family pass, there is an option to pay and extra $40 to get an annual pass that will get you unlimited admissions into 5 museums in our area. One of the museums is a large science museum that is quite pricey to attend if paid by the day/visit. Add the annual pass for the museums package to the $65 cost for an annual family pass to the zoo, and you have spent less than $200. This means that your family can go to all these places, unlimited number of times, for a year at that one price. The kids love going to these locations and it is worth it for us. I realize that not everyone would enjoy it, but this gives you an idea. I have finally come to the conclusion that the hardest part of remodeling is clearing out a room that has been used for storage. Our home has 2 rooms in the back section of the house, which is not heated in winter. Both of those rooms have become storage areas over the years. With the kids getting older, the need for more space is becoming one which we are having to focus upon. For years, my husband and I have been wanting to remodel the house. We love our 1890’s home, but it needs a bit of cosmetic improvements. It also needs a few upgrades, such as adding a heating system to the back section. We have nearly finished one of the rooms. Originally, it was to become a new bedroom for my husband and I. Now, it is becoming a bedroom for my adult son who is moving here from another state. Having it’s own outdoor entrance, it will be convenient for him. He will be able to use that room until he is able to get himself set up in his own place. The second of the 2 back rooms is one of the largest rooms of the house, It is going to become the kids’ bedroom. It is large enough that we are planning to divide the room into 2 smaller ones. Each will be about the size of a small bedroom in a mobile home, which is adequate for a single child per room. I have been clearing out the back rooms a little at a time over the winter. I have been brutal in the sorting of the items in those rooms. Easily 75% of what was there is being either trashed or donated. My attitude is that unless it is a tool or other item that is necessary, anything in storage for over 6 months is not going to be kept. I am literally only saving items such as photos, some furniture, and family heirlooms. Everything else will be gone. By May, both rooms will be nearly completed. The only thing unfinished will be adding the propane heaters and the dividing wall in the kids’ room. Both rooms will be ready for use, if not already being used. Hubby and I are going to temporarily be using the kids’ old bedroom once they are in their new space. I am looking forward to it. Over the next few years, we will be in a state of “room shuffling” while we work on the house. The kids’ current bedroom used to be a part of the old kitchen space. Originally, the house had a very large farm kitchen. A previous owner put a dividing wall up to make that extra bedroom. As soon as we no longer need that space as a bedroom anymore, the wall will be removed. The large farm kitchen will be its full size once more. The remodeling is something we have been dreaming about for many years. We have always been in a situation of either not having the money or not having the time. Now, we are finally in a position to get the work done. We will be doing most of it ourselves. That is one reason that I am so grateful that the “bones” of the house are in good shape. Yes, we may encounter surprises along the way. One would expect that when dealing with a house of this age, but I am looking forward to the challenge.